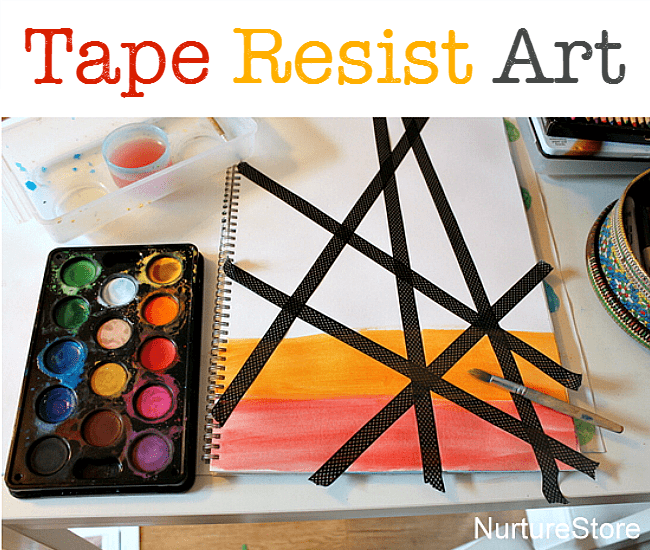 This watercolour washi tape resist art is great for all ages of children. The technique is really simple and produces an exciting ‘big reveal’ at the end. 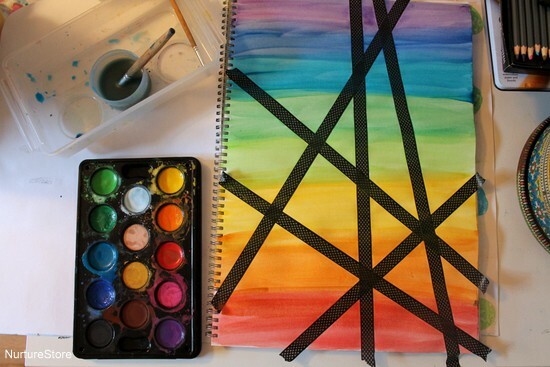 To try out this technique you’ll need some thick paper (watercolour paper is ideal), washi tape (or decorators’ tape) and some watercolour paints. 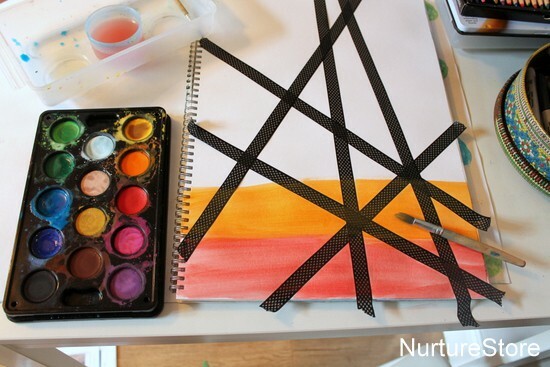 Start by sticking down strips of the washi tape to make a design. 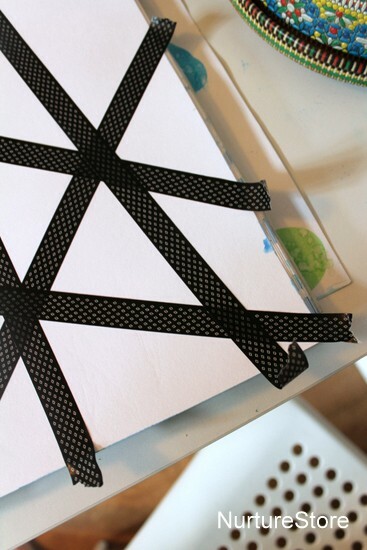 Washi tape is great for children to use as it’s really easy to tear the tape, so you don’t need any scissors. You can create any design you like. 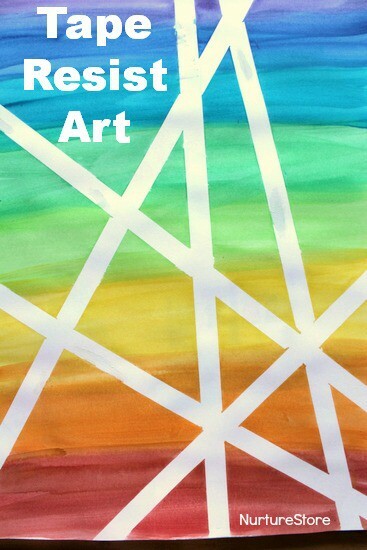 Lines, solid shapes, your initial…Perhaps start with a simple, bold design to try the technique at first, and then see how you can develop it. Leave the ends of the tape to hang over the edge of the paper slightly, so they’ll be easier to remove later. Then it’s time to paint. 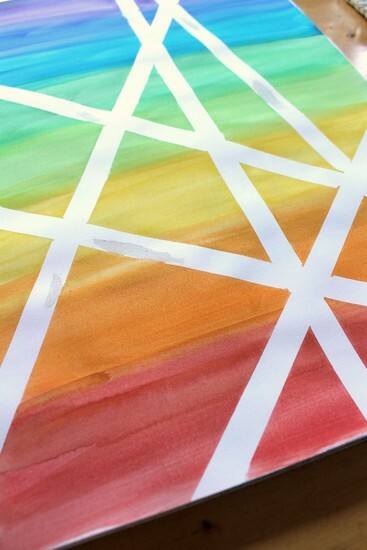 Use your watercolours to cover you page, painting right over the washi tape. Again, each child can chose their preferred colours, whether that’s a rainbow, colours to match their bedroom, or simply whatever is their favourite. We like to cover the whole page. You can overlap the colours so the edges of the stripes blend together, giving a gentle contrast to the very clear lines of the tape. Once the paint is dry, it’s time for the big reveal. 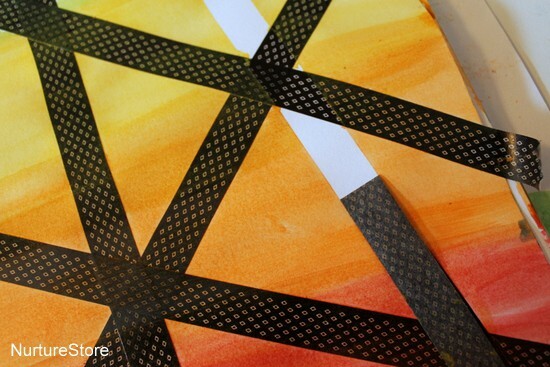 Carefully peel off your washi tape, trying not to tear the paper at all. If you have overlapping tapes, peel off the top layer first. The tape should come off easily. Then marvel at the art you have created! :: Do you prefer it with or without the tape? 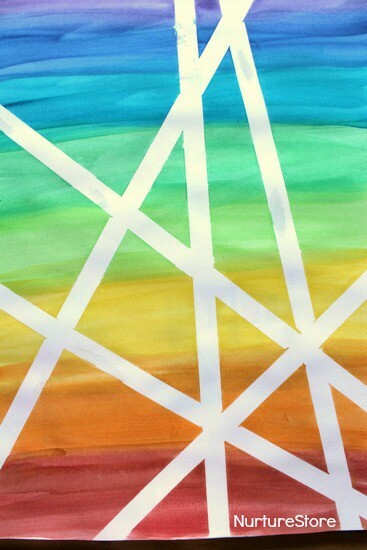 :: What shapes have you made in between the tape? :: What does your picture remind you of? 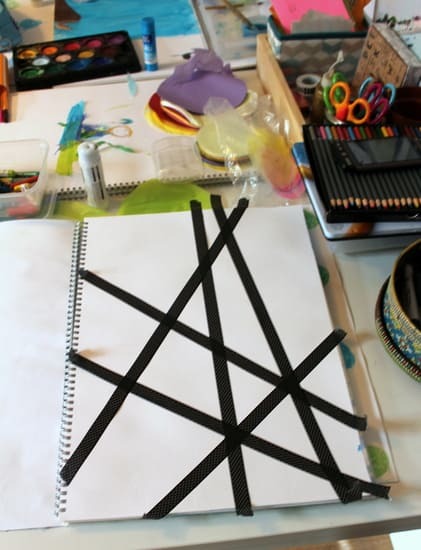 :: What shapes could you create with the tape next time? Previous article: Sand pit fairy garden :: small worlds playNext article: What’s the Just So Festival like for older kids?